Since malaria parasites highly depend on ribose 5-phosphate for DNA and RNA synthesis and on NADPH as a source of reducing equivalents, the pentose phosphate pathway (PPP) is considered an excellent anti-malarial drug target. In Plasmodium, a bifunctional enzyme named glucose 6-phosphate dehydrogenase 6-phosphogluconolactonase (GluPho) catalyzes the first two steps of the PPP. PfGluPho has been shown to be essential for the growth of blood stage Plasmodium falciparum parasites. Plasmodium vivax glucose 6-phosphate dehydrogenase (PvG6PD) was cloned, recombinantly produced in Escherichia coli, purified, and characterized via enzyme kinetics and inhibitor studies. The effects of post-translational cysteine modifications were assessed via western blotting and enzyme activity assays. Genetically encoded probes were employed to study the effects of G6PD inhibitors on the cytosolic redox potential of Plasmodium. Here the recombinant production and characterization of PvG6PD, the C-terminal and NADPH-producing part of PvGluPho, is described. 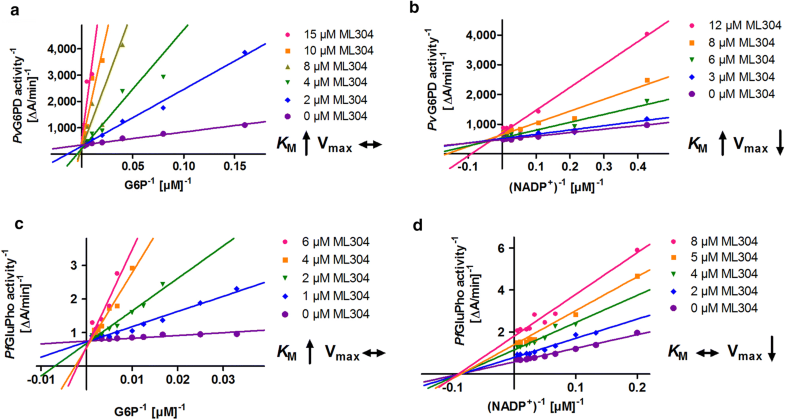 A comparison with PfG6PD (the NADPH-producing part of PfGluPho) indicates that the P. vivax enzyme has higher KM values for the substrate and cofactor. Like the P. falciparum enzyme, PvG6PD is hardly affected by S-glutathionylation and moderately by S-nitrosation. Since there are several naturally occurring variants of PfGluPho, the impact of these mutations on the kinetic properties of the enzyme was analysed. Notably, in contrast to many human G6PD variants, the mutations resulted in only minor changes in enzyme activity. Moreover, nanomolar IC50 values of several compounds were determined on P. vivax G6PD (including ellagic acid, flavellagic acid, and coruleoellagic acid), inhibitors that had been previously characterized on PfGluPho. ML304, a recently developed PfGluPho inhibitor, was verified to also be active on PvG6PD. Using genetically encoded probes, ML304 was confirmed to disturb the cytosolic glutathione-dependent redox potential of P. falciparum blood stage parasites. Finally, a new series of novel small molecules with the potential to inhibit the falciparum and vivax enzymes were synthesized, resulting in two compounds with nanomolar activity. The characterization of PvG6PD makes this enzyme accessible to further drug discovery activities. In contrast to naturally occurring G6PD variants in the human host that can alter the kinetic properties of the enzyme and thus the redox homeostasis of the cells, the naturally occurring PfGluPho variants studied here are unlikely to have a major impact on the parasites’ redox homeostasis. Several classes of inhibitors have been successfully tested and are presently being followed up. Plasmodium falciparum causes the most severe form of malaria and is responsible for nearly all malaria-related deaths [1, 2]. In contrast, Plasmodium vivax infections are usually not fatal; however, they can cause severe anaemia and can be followed by frequent relapses that can, for example, seriously affect the development of children . Therefore, early detection and appropriate treatment are essential in containing the consequences of P. vivax infection . Currently, the World Health Organization (WHO) recommends an artemisinin-based combination therapy (ACT) for the treatment of uncomplicated falciparum malaria, and chloroquine or ACT for the treatment of uncomplicated vivax malaria. In many cases, primaquine is used to eradicate liver stages and prevent relapses [2, 5]. However, spreading resistance of both P. falciparum and P. vivax to chloroquine underlines the importance of continuing drug development efforts . Here, a major challenge is to maintain P. vivax in continuous in vitro culture . In Plasmodium, the pentose phosphate pathway (PPP) is supposed to be the main source of ribulose 5-phosphate and NADPH, providing reducing equivalents for downstream glutathione and thioredoxin-dependent reactions, which are crucial for redox balance, redox regulatory, and redox signaling processes [7–9]. Redox metabolism represents an important drug target and has been shown to be involved in the mechanism of action of anti-malarial drugs as well as in drug resistance [8, 10–12]. As demonstrated for P. falciparum and other Apicomplexa [13, 14], the PPP of these parasites contains a bifunctional enzyme consisting of glucose 6-phosphate dehydrogenase (G6PD) and 6-phosphogluconolactonase (6PGL). This enzyme is referred to as GluPho. Recombinant P. falciparum GluPho has already been characterized in detail . In 2015, attempted double crossover disruption indicated that PfGluPho is essential for the growth of P. falciparum blood stages, confirming PfGluPho as a drug target . Therefore a high-throughput-compatible assay was developed, and various compound libraries were screened against the G6PD activity of PfGluPho, identifying two nanomolar inhibitors (ML276 and ML304) that are selective for P. falciparum G6PD over hG6PD and inhibit the growth of P. falciparum 3D7 in vitro [16–18]. The redox system of P. vivax shows high homologies to P. falciparum, including the presence of a bifunctional GluPho in the PPP. However, apart from a 2-Cys, a 1-Cys peroxiredoxin [19, 20] and glutathione S-transferase , the biochemistry of proteins contributing to the P. vivax cellular redox network has so far hardly been characterized . Attempts to transfer knowledge of the P. falciparum redox system and its inhibitors to P. vivax can, therefore, be very valuable in facilitating drug discovery against vivax malaria. It is well known that exposure to Plasmodium parasites has left marks on the human genome. Several genetic disorders such as sickle cell disease, thalassaemia, and G6PD deficiency show the same geographic distribution as falciparum and vivax malaria and offer a certain degree of protection from the infection (for review see ). G6PD deficiency is found in around 400 million people, especially in malaria-endemic regions, and can be caused by over 200 known mutations in the hG6PD-encoding gene . The mild and most common mutations result in reduced G6PD activity, and their protective effect against malaria is most likely based on enhanced phagocytosis of parasitized G6PD-deficient erythrocytes [25–27]. The Plasmodium genome also shows naturally occurring variations [28, 29] that help the parasites deal with evolutionary selection pressure, including host immunity and drug treatment [30, 31]. Sequencing the genome of P. falciparum derived from the blood of malaria-infected patients identified several mutations in the PfGluPho gene (PlasmoDB). These mutations have so far not been studied with respect to their functional consequences for enzyme activity. Here the biochemical and kinetic characterization of recombinant P. vivax G6PD, as well as of different variants of P. falciparum GluPho occurring in the field, are reported. 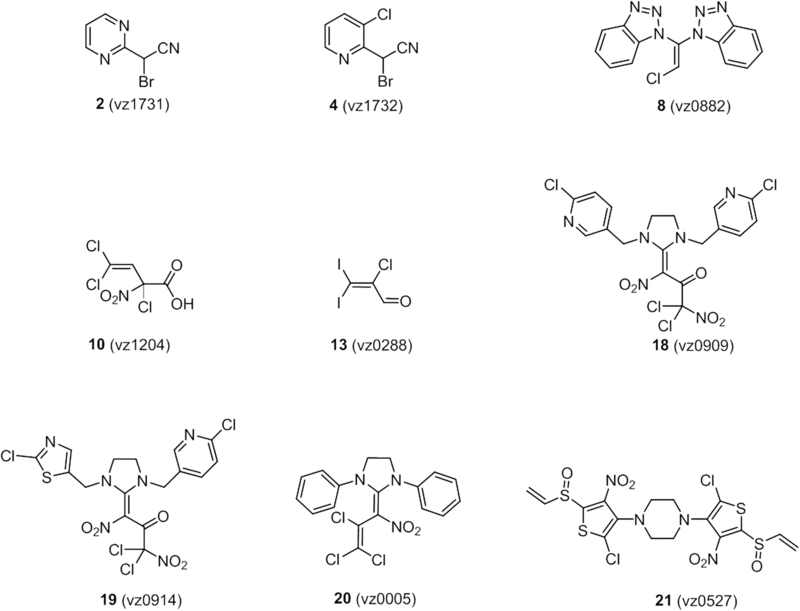 Several known and newly synthesized small molecule compounds are further described, with strong inhibitory effects on PvG6PD that might be used as a starting point for drug discovery against vivax malaria. All chemicals used were of the highest available purity and were obtained from Roth (Karlsruhe, Germany), Sigma-Aldrich (Steinheim, Germany), or Merck (Darmstadt, Germany). NADP+ was purchased from Biomol (Hamburg, Germany), Ni–NTA agarose from Cube Biotech (Monheim am Rhein, Germany), RPMI 1640 medium from Gibco (Paisley, United Kingdom), and artemisinin (ATS) and chloroquine (CQ) from Sigma-Aldrich (Steinheim, Germany). ML304 was synthesized as described previously . Ellagic acid (EA) was purchased from Sigma-Aldrich (Steinheim, Germany). Two synthetic derivatives of EA, flavellagic acid (FEA) and coruleoellagic acid (CEA), were synthesized as described previously [32–34]. WR99210 was kindly supplied by Jacobus Pharmaceuticals (New Jersey, USA). Stock solutions of diamide (DIA), DTT, and CQ were dissolved in sterile ddH2O, while all others were dissolved in DMSO. The gene of PvGluPho (PlasmoDB accession number PVX_117790) is composed of one exon with 2784 bp and does not contain an EcoRI recognition site. The gene was amplified via PCR using a vivax EcoRI DNA-library-obtained by MR4—as a template using primers (OPvGPNatatGGATCCGATTGCCAGGCGCTGGCGAA and OPvGPCatatGTCGACTCAGTTGATGTCCAACAAGTCGT), introducing restriction sites for BamHI and SalI (underlined). The construct was cloned into the cloning vector pBluescriptSK+, and the insert was verified via in-house sequencing. For heterologous overexpression, the construct was subcloned into the vectors pQE30 and pET28a using the same restriction sites. The G6PD part of PvGluPho (PvG6PD, aa 310-927) was amplified via PCR (bp 930–2784) using primer sense with a BamHI recognition site (underlined, 5′-CGGGATCCCTGAATAGGAGGGAATGCCTA-3′), and antisense with a SalI site (5′-atatGTCGACTCAGTTGATGTCCAACAAGTCGT-3′), and was cloned into the vector pQE30 for heterologous overexpression. The sensor hGrx1–roGFP2 (human glutaredoxin 1-reduction–oxidation sensitive green fluorescent protein 2) was recently transiently expressed in 3D7 P. falciparum parasites by using the pARL1a(+) expression vector. Heterologous overexpression of hGrx1–roGFP2 for the evaluation of the in vitro interactions of ML304 and anti-malarial drugs with the recombinant redox probe was performed according to . Multi-sequence alignments of G6PDs from various species showed the presence of a prominent SS pair at the C-terminal end of GluPho from P. falciparum and other plasmodial species. This is absent in other G6PDs such as man and Saccharomyces cerevisiae (Additional file 1). Amongst other residues, these two serines could be phosphorylated as demonstrated by several groups [36–38]. Therefore, they were mutated to glutamate in order to create phosphomimetic mutants (PfGluPhoS899E, PfGluPhoS900E) . This allowed studying possible consequences of protein phosphorylation on the activity and substrate affinity of PfGluPho. Moreover, naturally occurring SNPs of PfGluPho were chosen based on data provided in PlasmoDB. To analyse the influence of these SNPs on PfGluPho activity, different mutations were introduced into PfGluPho wt via site-directed mutagenesis. Single mutations were introduced at Ser315 (PfGluPhoS315Y), Leu395 (PfGluPhoL395F), and Phe507 (PfGluPhoF507L). The coding sequence for PfGluPho wt (PlasmoDB PF3D7_1453800) was cloned and expressed as described elsewhere . To obtain the mutants, PfGluPho wt was used as a template, Pfu polymerase (Promega, Mannheim, Germany), and the mutagenesis primers listed in Additional file 2. Methylated, non-mutated template plasmids were digested with DpnI (Thermo Scientific, Dreieich, Germany), and the correct mutations were confirmed via in-house sequencing. PfGluPho wt, its mutants, PfG6PD, and the human homologue hG6PD were produced as described previously . For the heterologous overexpression of PvGluPho, numerous Escherichia coli strains were tested under various conditions. However, none of the conditions tested so far yielded active proteins. Therefore, PvG6PD was heterologously overexpressed in E. coli M15 (Qiagen, Hilden, Germany) containing the plasmid pRAREII (Novagen, Darmstadt, Germany) for overcoming the codon bias in E. coli. Cells were grown in terrific broth medium, supplemented with carbenicillin, kanamycin (both 50 µg mL−1), and chloramphenicol (12.5 µg mL−1) at 37 °C. After an optical density at 600 nm of 0.6–0.8 was reached, overexpression was induced with 1 mM isopropyl-β-d-thiogalactopyranoside (IPTG). After 20 h shaking at room temperature, cells were harvested via centrifugation (15 min, 12,000 g, 4 °C), resuspended in 500 mM NaCl, 50 mM Tris, pH 7.8, and mixed with protease inhibitors (100 µM phenylmethylsulfonyl fluoride, 150 nM pepstatin A, 40 nM cystatin). The cells were lysed with lysozyme and DNaseI for at least 14 h at 4 °C, sonicated (three cycles of 30 s at 70% and 4 °C), and centrifuged (30 min, 25,000 g, 4 °C). The supernatant was applied to a Ni–NTA agarose column; unspecifically bound proteins were eluted with 500 mM NaCl, 50 mM Tris, pH 7.8, and increasing imidazole concentrations from 10 to 40 mM imidazole. The recombinant proteins were eluted under the same buffer conditions containing 80–500 mM imidazole. To improve the purity of the proteins, size exclusion chromatography was performed as described in , followed by a control of the final purity of protein via SDS-PAGE using a 12% gel. The protein was stored with 50% glycerol at −80 °C. The G6PD activity of PfGluPho variants was measured spectrophotometrically as described for the wt enzyme . Kinetic characterization of PvG6PD was performed using the same assay system at an Evolution 300 spectrophotometer (Thermo Scientific, Dreieich, Germany). In brief, the initial reduction of NADP+ to NADPH by PvG6PD was monitored by measuring the absorbance at 340 nm. The 500 µL reaction mixture contained 200 µM NADP+ and varying concentrations of PvG6PD in an assay buffer of 100 mM Tris–HCl, pH 8.0, 10 mM MgCl2, and 0.5 mM EDTA at 25 °C. The reaction was started by adding 800 µM G6P. The KM for NADP+ was determined by titrating NADP+ from 2 to 400 µM at 800 µM G6P; the KM for G6P was measured accordingly by titrating G6P from 2 to 1200 µM at 200 µM NADP+. KM values were calculated using GraphPad Prism. Since the KM for G6P was considerably higher than the value measured for PfGluPho , a concentration of 800 µM G6P was defined as substrate saturation for PvG6PD. To investigate the susceptibility of PvG6PD, PfG6PD, and PfGluPho to S-glutathionylation, purified enzymes were reduced with 5 mM DTT for 30 min at 4 °C in 500 mM NaCl, 50 mM Tris, pH 7.8. Afterwards, DTT was removed using Zeba™ spin desalting columns (ThermoFisher Scientific, Waltham, MA, USA) according to the instructions of the manufacturer. The proteins were adjusted to a final concentration between 18.5 and 30.3 µM and incubated with 0, 2, 6, or 10 mM GSSG for 10 min at 37 °C, followed by desalting as described above. Afterwards, the samples were applied to non-reducing SDS-PAGE, while reducing SDS-PAGE was used to test the reversibility of the potential modification. As a positive control, recombinant PfPrx1a was used, which had been previously proved to be part of the glutathionylome of P. falciparum . Ponceau staining of the membrane after blotting served as a loading control. S-glutathionylated protein was detected via semi-dry western blotting using a monoclonal anti-glutathione antibody (Virogen, Massachusetts, USA; diluted 1:250 in 5% nonfat milk with Tris-buffered saline Tween-20 (TBST)) and a horseradish peroxidase-conjugated goat anti-mouse antibody (Dianova, Hamburg, Germany; diluted 1:10,000 in 5% nonfat milk with TBST). Experiments were carried out in at least duplicate using different batches of enzyme. To examine the susceptibility of P. vivax G6PD and P. falciparum G6PD/GluPho to S-nitrosation, a biotin switch assay was performed as described in [41, 42], finally detecting S-nitrosated thiol groups via α-biotin western blot analysis. In brief, pre-reduced proteins were adjusted to a concentration between 7.4 and 12.1 µM and incubated with 0 or 1 mM S-nitroso-glutathione (GSNO) in 50 mM Tris, pH 7.4, 1 mM EDTA, and 0.2 mM neocuproine (GSNO buffer) for 1 h at 22 °C in the dark. The reaction was stopped by adding 100% ice-cold acetone, followed by protein precipitation for 30 min at −20 °C. The samples were centrifuged (8000 g, 4 °C, 5 min); the supernatant was discarded; and the pellets were washed three times with 70% ice-cold acetone, each time followed by centrifugation (first centrifugation 8000 g, followed by 5000 g, 4 °C, 5 min). Residual cysteine thiols were blocked by resuspending the pellets in 8 M urea, 50 mM Tris, pH 8.0, 1 mM EDTA, 0.1 mM neocuproine (blocking buffer) containing 200 mM iodoacetamide (IAA) and incubation in the dark for 45 min at 50 °C. The reaction was stopped by adding 100% ice-cold acetone, protein precipitation, and washing the pellets as described above. Afterwards, the pellets were dissolved in 4 M urea, 50 mM Tris, pH 8.0, 1 mM EDTA, 0.01 mM neocuproine (labelling buffer) containing 20 mM NaAsc and 0.2 mM iodoacetyl-PEG2-biotin and incubated for 1 h in the dark at 25 °C. Samples without NaAsc served as negative controls. The reaction was stopped as described above. After washing, the pellets were resuspended in blocking buffer and applied to SDS-PAGE. S–nitrosated protein was detected indirectly via semi-dry western blotting using a monoclonal anti-biotin antibody (Santa Cruz, Dallas, USA; Biotin Antibody (33): sc-101339; diluted 1:1000 in 5% nonfat milk with TBST) and a horseradish peroxidase-conjugated goat anti-mouse antibody (Dianova, Hamburg, Germany; diluted 1:10,000 in 5% nonfat milk with TBST). As a loading control, SDS-PAGE was performed, followed by Coomassie staining the proteins using 18 µL (1:10 dilution) of the samples used for western blotting (2 µL were applied to SDS-PAGE for western blotting, 1:10 dilution for PfGluPho, and 1:50 dilution for PfG6PD and PvG6PD due to higher protein concentrations). To study the impact of GSNO-mediated S-nitrosation on the activity of the enzymes, 1.9–3.0 µM of reduced enzyme was incubated with 0–1000 µM GSNO in GSNO buffer for up to 180 min at 22 °C in the dark. Neocuproine was added as a chelating agent in order to decrease S-NO breakage by copper ions, which had been previously observed . Aliquots were taken at different time points to measure the activity, using the assay described above. To study the reversibility of S-nitrosation, PvG6PD, PfG6PD, and PfGluPho were nitrosated as described above, followed by incubation with 5 mM DTT for 30 min at 4 °C. Afterwards, the enzyme activity was determined using the assay described above. Based on an initial screening approach, a set of compounds with the potential to inhibit PfGluPho has been synthesized. The structures of the most active synthetic compounds are depicted in Fig. 8. The synthesis and characterization of pyrimidine 2 (vz1731), pyridine 4 (vz1732), ketene aminal 8 (vz0882), carboxylic acid 10 (vz1204), aldehyde 13 (vz0288), and imidazolidine 18 (vz0909) are described in Additional file 3; the synthesis and characterization of imidazolidines 19 (vz0914) and 20 (vz0005) are described in  and , respectively, and thiophene 21 (vz0527) in . All spectral data was in accordance with the literature. To identify potential inhibitors of PvG6PD, compounds with already known effects on PfGluPho (ellagic acid and derivatives, ML304) were tested. Additionally, several compound libraries of the Helmholtz Center for Infection Research, Brunswick, were screened against PfGluPho using the high-throughput-compatible assay systems described in Preuss et al. [16, 17]. The compound library synthesized by DK and VZ mainly consisted of structurally diverse heterocyclic compounds that had already proved to be microbiologically active in other areas such as anti-infectants and insecticides for plant protection. Based on structure-activity relationship studies, a set of new potential G6PD inhibitors (Fig. 8) was then synthesized and assessed. First, the IC50 values of the compounds were determined, followed by mechanistic characterization of the mode of action. To test for selectivity of the compounds, the IC50 values of the compounds on PvG6PD, PfGluPho, and hG6PD were determined in parallel. Compounds 8 (vz0882), 18 (vz0909), and 19 (vz0914) were less stable in the assay buffer; the compounds with the highest efficiency, 21 (vz0527), 2 (vz1731), and 4 (vz1732), were only active when the powder was freshly dissolved. All measurements were performed in 96-well plates, half area (Greiner Bio-One, Frickenhausen, Germany) using a Tecan Infinite M200 plate reader (Maennedorf, Switzerland). The compounds were dissolved in 100% DMSO and afterwards diluted in assay buffer to the required concentrations. Different compound concentrations were added to a mixture of enzyme and NADP+ in assay buffer. Concentrations of substrates differed depending on the enzyme; an overview is given in the Additional file 4. The reaction was started by adding G6P, and the increase of NADPH was monitored by measuring the absorbance at 340 nm. To increase the sensitivity of the assay, some measurements were reproduced, detecting the fluorescence of NADPH at ex340/em460. The assay contained both substrates either in saturation or at concentrations close to KM to facilitate the identification of competitive inhibitors. A negative control containing no compound was defined as 0% inhibition; a positive control lacking the substrate G6P was defined as 100% inhibition. For evaluations using GraphPad Prism and Microsoft Excel, only a linear increase in absorbance/fluorescence was considered. For the mechanistic characterization of the compounds, either NADP+ or G6P were titrated at different compound concentrations around the IC50, while keeping the second substrate in saturation. The initial slope was plotted as Michaelis–Menten curves and Lineweaver–Burk plots using GraphPad Prism; KM values and Vmax were calculated with GraphPad Prism software. The CQ-sensitive P. falciparum 3D7 and NF54-attB strains were cultured as described in [47, 48], respectively. Briefly, the strains were propagated in red blood cells (RBCs) (A+) in RPMI 1640 medium supplemented with 0.5% w/v Albumax, 9 mM glucose, 0.2 mM hypoxanthine, 2.1 mM l-glutamine, 25 mM HEPES, and 22 µg mL−1 gentamycin at 3.3% haematocrit and 37 °C in a gaseous mixture consisting of 3% O2, 3% CO2, and 94% N2. Plasmodium falciparum parasites were synchronized with 5% (w/v) sorbitol . Plasmodium falciparum trophozoites were enriched via magnetic separation . Cell lysates were obtained via saponin lysis . Parasitaemia was counted on Giemsa-stained blood smears. Plasmodium falciparum was transfected as described in . ML304 was used at concentrations of 10 nM to 1 mM in degassed standard reaction buffer (100 mM potassium phosphate, 1 mM EDTA, pH 7.0). The in vitro interaction of the pharmacologically used anti-malarial drugs ATS and CQ with the purified hGrx1–roGFP2 protein had been determined previously and did not have an effect at the concentrations used in this study . The characterization of the in vitro interaction of hGrx1–roGFP2 with ML304 was performed according to Schuh et al. .
A Leica confocal system TCS SP5 inverted microscope equipped with the objective HCX PL APO 63.0 × 1.30 GLYC 37 °C UV connected to a 37 °C temperature chamber was used. The argon laser power was set to 20%; scanning was performed at 400 Hz frequency and at a 512 × 512 pixel resolution. The smart gain and smart offset were 950 V and −0.9%, respectively. With a sequential scan, the hGrx1–roGFP2 probe was excited at 405 nm and at 488 nm and emission was detected at 500–550 nm. Laser intensity was adjusted to match the full dynamic range of the probe to the dynamic range of the detector (405 nm: 10%, 488 nm: 4%). Autofluorescence images were simultaneously taken at ex 405/em430–450 and individually defined together with the background for every image, but no fluorescence signal could be detected. The Leica LAS AF Lite software for fluorescence analysis was used. The 405/488 nm ratio was calculated. The graphs were plotted using the GraphPad Prism 5 software (San Diego, CA, USA). For live cell imaging, only parasites showing fluorescent signals at both 405 and 488 nm excitation and an intact host cell were chosen. NF54[hGrx1–roGFP2] parasites were washed and resuspended after incubation in pre-warmed Ringer’s solution to a concentration of 2.0 × 105 iRBCs/µL. 10 µL of cells (1 × 106 iRBCs) were transferred to each well of a 384-well plate (black, flat bottom, Greiner Bio-One, Frickenhausen, Germany) and were measured with the plate reader Clariostar (BMG Labtech, Ortenberg, Germany) with excitation wavelengths at 405 nm and 475 nm (emission 510 nm). The gain of the 405 nm and 475 nm excitation wavelengths was adjusted to match the full dynamic range of the hGrx1–roGFP2 redox sensor. The 405/475 nm ratio was then calculated. The graphs were plotted using the GraphPad Prism 5 software (San Diego, CA, USA). A one-way ANOVA test with 95% confidence intervals with the Dunnett’s multiple comparison test (GraphPad Prism 5.0) was applied for statistical analysis of significance (*p < 0.05; **p < 0.01; ***p < 0.001). The effect of ML304 and the anti-malarial drugs ATS and CQ as reference drugs on P. falciparum were investigated in 4 h and 24 h incubation experiments. The half-maximal effective concentration (EC50) of ML304 on P. falciparum 3D7 (471.3 ± 39.5 nM) asexual blood stages was determined with the [3H]-incorporation assay and also used as a reference value for setting up the NF54[hGrx1–roGFP2] experiments. The EC50 of ATS (4.4 nM) and CQ (8.6 nM) were determined previously . For 4 h experiments, trophozoite stage parasites (26–30 h) of 3D7[hGrx1–roGFP2] and NF54[hGrx1–roGFP2] (6–8% parasitaemia) were magnetically enriched (Miltenyi Biotec, Germany), counted by using a Neubauer hemocytometer (Brand GmbH, Germany), and returned to cell culture (at 2.0 × 104 trophozoites μL−1) for at least 1 h to recover. 1.0 × 106 cells in 100 μL cell culture medium were placed into LoBind tubes (Eppendorf, Hamburg, Germany) for 4 h incubation experiments. The parasites were treated with ML304 at 1 μM, 50 μM, and 100 μM, or with the anti-malarial drugs ATS and CQ at approximately 50 × EC50 for 4 h under cell culture conditions. Subsequently, free thiol groups were blocked with 2 mM N-ethylmaleimide (NEM) for 15 min at 37 °C. For 24 h experiments, a 5 mL culture (5% haematocrit, 6–8% parasitaemia) of ring stage parasites (6–10 h post invasion) was treated with ML304 at 1 μM, 5 μM, and 10 μΜ, or the anti-malarial drugs ATS and CQ at approximately 4 × EC50. Prior to enrichment, cysteines were blocked with 2 mM NEM for 15 min at 37 °C. For 4 h and 24 h experiments, cells were washed after incubation and resuspended in Ringer’s solution (122.5 mM NaCl, 5.4 mM KCl, 1.2 mM CaCl2, 0.8 mM MgCl2, 11 mM d-glucose, 25 mM HEPES, 1 mM NaH2PO4, pH 7.4). 50 μL of cells (1.0 × 106 cells 50−1 μL−1) were seeded onto poly-l-lysine-coated μ-Slides 18 well (flat) (Ibidi, Martinsried, Germany) and measured using CLSM (confocal laser scanning microscopy) with excitation wavelengths at 405 nm and 488 nm. All experiments included non-treated parasites as controls and both fully reduced and fully oxidized parasites with 10 mM DTT and 1 mM DIA, respectively (2 min incubation), prior to blocking with NEM. Each experiment was carried out three times. Between 10 and 20 microscopy images were taken each time, resulting in at least 30 experimental values per concentration and incubation time. The obtained ratio values were normalized to the control value, which was set to 100. All experiments were carried out within 6 weeks after the appearance of transfectants. Mean and standard error of the mean (SEM) are shown. A one-way ANOVA test with 95% confidence intervals with the Dunnett’s multiple comparison test (GraphPad Prism 5.0) was applied for statistical analysis of significance (*p < 0.05; **p < 0.01; ***p < 0.001). Functional P. vivax glucose 6-phosphate dehydrogenase, representing the C–terminal part (aa 310–927) of PvGluPho, was recombinantly produced using a pQE30 vector in E. coli M15 cells containing the pRAREII plasmid. The yield was 0.1–0.4 mg of active PvG6PD per litre of E. coli culture. The final purity of the enzyme was checked via SDS-PAGE (Fig. 1). The recombinant production of the full-length enzyme was attempted in parallel but remained extremely challenging and is therefore not reported in this manuscript. The Vmax of PvG6PD was determined to be 5.6 ± 0.7 U mg−1; the KM values were 14.8 ± 2.9 µM for NADP+ and 80.2 ± 19.8 µM for G6P. A comparison of the kinetic parameters of PvG6PD to PfG6PD, full-length PfGluPho, and human G6PD is shown in Table 1. The kinetic data of PvG6PD was determined using the standard enzyme assay for PfGluPho according to Jortzik et al. and Beutler [14, 53] with slight modifications. Gel filtration chromatography was used to study the oligomerization behaviour of PvG6PD. Under reducing conditions, PvG6PD eluted as a single peak of approximately 389 kDa, indicating that the protein is present as a hexamer (calculated molecular mass of the recombinant His-tagged protein: 71.9 × 6 = 431.4 kDa) and that this oligomerization is not primarily based on intermolecular disulfide bonds. S-glutathionylation has previously been proposed to regulate the activity of PfGluPho . In this study, pre-reduced PvG6PD was therefore incubated with increasing concentrations of GSSG (up to 10 mM), followed by western blot analysis using anti-glutathione antibodies. PfGluPho and the C-terminal part (PfG6PD) were studied in parallel. Surprisingly, none of the blots showed a signal at the expected height of the proteins (Fig. 2), indicating that neither PfGluPho nor the C-terminal G6PD part of both P. falciparum and P. vivax were susceptible to redox-regulation via S-glutathionylation. It was previously stated that high concentrations of GSSG (8–10 mM) completely inhibit the activity of PfGluPho . After incubation with 10 mM GSSG, however, precipitation of all three enzymes was observed, which also resulted in a lack of the protein bands in the Ponceau-stained membranes (Fig. 2). Therefore, this loss of activity is likely based on an irreversible loss of conformation rather than on redox regulation. To identify potential S-nitrosation in PfGluPho/PfG6PD as well as PvG6PD, pre-reduced enzymes were incubated with 1 mM GSNO and afterwards subjected to the biotin-switch assay . GSNO is a physiologically relevant S-nitrosated derivative of glutathione capable of transnitrosating proteins . Western blot analyses clearly showed a signal at the expected height for the samples treated with 1 mM GSNO and NaAsc. In contrast, control samples without NaAsc or without GSNO showed no signal (Fig. 3). To investigate the impact of S-nitrosation on the activity of the enzymes, the pre-reduced proteins were incubated with different concentrations of GSNO (0–1000 µM), and their remaining activities were measured at several time points. Incubation with 1000 µM GSNO for 3 h resulted in an inhibition of only 20–25%; lower concentrations and shorter incubation times resulted in even lower inhibition, indicating that PfGluPho, its C-terminal part PfG6PD, and PvG6PD as the C-terminal part of PvGluPho are most likely not extensively regulated via S-nitrosation (Fig. 3). This is further underscored by the fact that adding DTT as a reducing agent was not able to restore the enzyme activities completely. There are several naturally occurring variants of PfGluPho. These variants (single nucleotide polymorphisms) were identified via a detailed in silico analysis of the (former) ID: PF14_0511 (now PF3D7_1453800) in the malaria database PlasmoDB. The most prominent SNPs in the G6PD part of the enzyme leading to an amino acid exchange were S315Y, L395F, and F507L. So far, there have been no investigations on whether these mutations have an impact on enzymatic activity. Furthermore, several amino acid residues (including S327, Y329, S330, S332, S477, T492, S701, S899, and S900) of PfGluPho were found to be phosphorylated in the parasites. Interestingly, the presence of the C-terminally located Ser–Ser pair (S899 and S900) was found to be specific for and highly conserved in Plasmodium species. Furthermore, the phosphorylation of these two residues was consistently identified by several groups [36–38] (for sequence alignment with G6PDs from different species, please see Additional file 1). To study whether the naturally occurring variants have an impact on PfGluPho activity, the respective mutations were inserted into the recombinant protein. To mimic S-phosphorylation as described in Kim et al. , Ser → Glu mutations were inserted at aa positions 899 or 900. After purification and size exclusion chromatography under reducing conditions, all mutants eluted as tetramers, indicating that the oligomerization is not based on disulfide bonds between the subunits and was not disturbed by the mutations. This is in accordance with the literature for the wt enzyme . The yield of pure and active PfGluPho mutants varied from 0.3 to 2.2 mg per liter E. coli culture. An overview of the kinetic data is given in Table 2. The values for the wt enzyme are in accordance with previously reported data . The Vmax values of the enzyme mutants ranged between 4.0 and 6.0 U mg−1 and did not show any major differences from the wt enzyme (5.9 ± 1.0 U mg−1 for G6P, 5.9 ± 0.6 U mg−1 for NADP+, see also ). The KM values were in the range of 18.4 and 29.2 µM for G6P (wt: 20.3 ± 5.6 µM, see also ) and of 3.7 and 6.2 µM for NADP+ (wt: 6.1 ± 1.3 µM, see also ). This indicates that neither the naturally occurring mutants of the G6PD part of PfGluPho nor the mimicked phosphorylation of the two C-terminally located serine residues have a major impact on the catalytic activity of the enzyme. Further experiments using phosphorylated PfGluPho need to be performed to confirm these results. As previously reported, ellagic acid, a polyphenolic lactone extracted from plants used in traditional medicine in Africa, reversibly inhibits PfGluPho with an IC50 of 77 ± 22 nM . In this study, ellagic acid is shown to also inhibit the P. vivax enzyme PvG6PD with an IC50 of 32.5 ± 13.4 nM. Mechanistic characterization indicated that ellagic acid acts as a mixed type inhibitor against both G6P and NADP+ in PvG6PD, which is identical to the mechanism determined for the P. falciparum enzyme . With increasing EA concentrations, the KM values for both substrates increased, while Vmax decreased (Fig. 4). In addition to EA, the effects of two EA derivatives, FEA and CEA, on PvG6PD were determined. FEA inhibited PvG6PD with an IC50 of 37.2 ± 5.8 nM, and CEA showed an IC50 of 44.4 ± 1.9 nM. Via a high-throughput screening of the MLSMR chemical library, the compound ML304 was identified as a selective inhibitor of the G6PD activity of PfGluPho. The IC50 was found to be 190 nM on the P. falciparum enzyme and 80 µM on human G6PD . Under conditions of substrate saturation (800 µM G6P, 200 µM NADP+), ML304 was found to inhibit PvG6PD with an IC50 of 15.3 ± 0.9 µM. Application of substrate and coenzyme close to the KM values of PvG6PD (85 µM G6P, 15 µM NADP+) resulted in a lower IC50 of 2.6 ± 0.8 µM. This was confirmed by mode of inhibition studies, which showed that ML304 acts as a competitive inhibitor towards G6P (Ki = 0.7 ± 0.3 µM) and as a mixed type inhibitor towards NADP+ (Ki = 16.3 ± 8.8 µM) (Fig. 5a, b) . On PfGluPho, ML304 also competes with G6P (Ki = 0.23 ± 0.16 µM). Towards NADP+, it acts as a non-competitive inhibitor (Fig. 5c, d). ML304  has recently been described to strongly impair the viability of Plasmodium gametocytes, the sexual forms of the parasite that can be transmitted to the Anopheles vector . To further characterize the biological effects of the G6PD inhibitor ML304, its influence on the cytosolic glutathione-dependent redox potential was determined. For this, the genetically encoded redox sensor hGrx1–roGFP2 (consisting of human glutaredoxin 1 coupled to redox-sensitive green fluorescent protein) was transiently expressed in the cytosol of transfected P. falciparum 3D7 parasites. Mid- and long-term exposures were carried out via confocal laser scanning microscopy (CLSM). Control studies excluded a direct interaction of ML304 and the drugs ATS and CQ with the recombinantly purified hGrx1–roGFP2 probe at the concentrations used in this study. 3D7[hGrx1–roGFP2]-enriched trophozoites were treated with different concentrations of ML304 and the anti-malarial drugs ATS and CQ based on their EC50 values  for 4 h and 24 h under cell culture conditions, and reactions were subsequently blocked with 2 mM NEM. The EC50 value of ML304 on P. falciparum 3D7 determined in the 72 h hypoxanthine incorporation assay was confirmed to be in the mid-nanomolar range (471.3 ± 39.5 nM). Figure 6a shows that ML304 had significant effects on 3D7[hGrx1–roGFP2] parasites at all concentrations used in the 4 h incubation experiments (p < 0.05 at 1 µM, p < 0.001 at 50 µM and 100 µM). In 24 h experiments (Fig. 6b), ML304 also significantly increased the 405/488 nm ratio of the hGrx1-roGFP2 sensor (p < 0.05 at 1 µM, p < 0.001 at 50 µM and 100 µM). 50 µM of ML304 in 4 h incubations seemed to completely oxidize the sensor as 5 µM of ML304 in 24 h incubations did, which was comparable to the treatment with 1 mM DIA. Therefore, higher concentrations above 50 µM (4 h) and 5 µM of ML304 (24 h) did not increase oxidation of the probe. 24 h incubation with ATS and CQ hardly affected the 405/488 nm ratio at the concentrations used in the experiment. Only CQ increased the redox ratio 1.5-fold in the 24 h incubations (Fig. 6b). 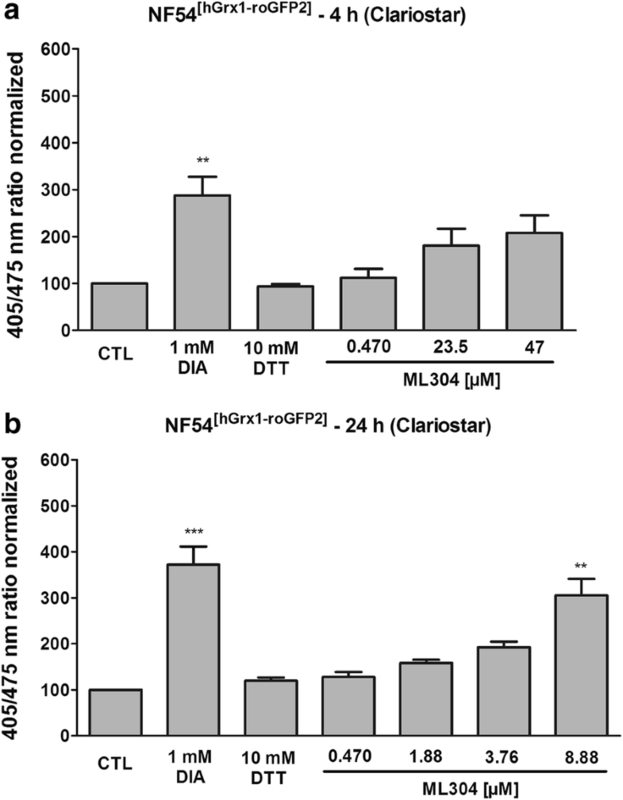 Recently, the cytosolic glutathione redox sensor was stably integrated into NF54-attB parasites . The direct response of NF54[hGrx1–roGFP2] to mid- and long-term exposures were determined using the time-efficient plate reader (Clariostar). Cells were incubated with 1 to 100 times EC50 ML304 for 4 h at the trophozoite stage or with approx. 1 to 20 times EC50 for 24 h at the ring stage, and reactions were subsequently blocked with 2 mM NEM. As depicted in Fig. 7, ML304 oxidized the cytosol, leading to an increase of the 405/488 nm ratio of the probe in a concentration-dependent manner with significant differences after a 24 h incubation. Treatment with 8.88 µM ML304 for 24 h significantly increased the 405/475 nm fluorescence ratio (threefold, p < 0.01). In order to identify potential novel inhibitors of Plasmodium G6PD, several libraries of the Helmholtz Center for Infection Research, Brunswick, were screened against PfGluPho using the high-throughput-compatible assay systems described in Preuss et al. [16, 17]. The compound library developed by DK and VZ (Clausthal University of Technology) and distributed by Florenz Sasse (Helmholtz Center for Infection Research) centres on the downstream chemistry of the synthetic key units trichloronitroethylene and 2-nitroperchloro-1,3-butadiene. Based on structure–activity relationships of the PASS system (Prediction of Activity Spectra for Substances), the general biological potential of an organic drug-like molecule could be predicted. 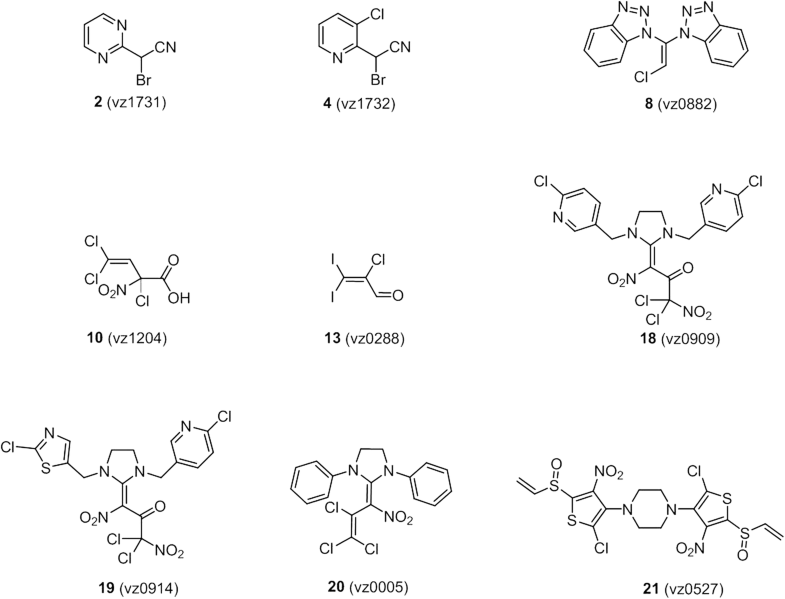 A set of new potential G6PD inhibitors was then synthesized and assessed (Fig. 8). All compounds were tested on PfGluPho, PvG6PD, and human G6PD (Table 3). 21 (vz0527) and 4 (vz1732) were the most potent compounds, with IC50s reaching the nanomolar range. The IC50 values of the two compounds on hG6PD were one to two orders of magnitude higher, indicating that a selective targeting of the plasmodial enzymes is possible. The partially high standard deviations were due to limited solubility or stability of the compounds. In order to further characterize the most potent, but structurally rather simple, compound 4 (vz1732), its mode of action against PfGluPho was determined. The compound was found to act non-competitively against both the substrate G6P and the coenzyme NADP+ (Fig. 9), indicating that the compound does not interact with either of the two binding sites. The key enzyme of the oxidative PPP of P. falciparum—PfGluPho—has been shown to be essential for blood stage parasites and is a potential target for the development of new anti-malarial drugs [14, 15]. The corresponding enzyme of P. vivax—PvGluPho—also exists as a bifunctional enzyme and shares high structural and functional similarity with PfGluPho (71.2% identity and 79.9% similarity on aa level, Additional file 5). In this study, the cloning, heterologous overexpression, and purification of PvG6PD, representing the C-terminal part of PvGluPho, is described. When comparing the kinetic parameters of PfGluPho and PvG6PD, higher KM values for substrate and cofactor became evident for the P. vivax enzyme, indicating that the P. falciparum enzyme is likely to have advantages when competing with the human host G6PD for substrates. Whether this fact contributes to the higher pathogenicity of P. falciparum deserves to be studied in more detail. Interestingly, the KM for G6P of PfG6PD (33.2 ± 1.2 µM ) is higher than the KM of the full-length enzyme PfGluPho (19.2 ± 3.9 µM), and the catalytic efficiency is lower (1.9 × 105 L mol−1 s−1 for PfG6PD, 4.4 × 105 L mol−1 s−1 for PfGluPho, see ). This might be explained by structural advantages of the fusion protein, which plays a central role in the parasites’ metabolism . This notion might also be true for the P. vivax enzyme; the fusion of G6PD with 6PGL in full-length PvGluPho and the potentially altered oligomerization state of the protein might result in lower KM values and a higher catalytic activity. Confirming measurements using the full-length enzyme need to be conducted as soon as it is available. Interestingly, however, Vmax and corresponding kcat values are one order of magnitude higher in hG6PD than in the plasmodial enzymes, resulting in a higher catalytic efficiency of the human enzyme (Table 1). This underscores the importance of G6PD for red blood cells and might be (partially) compensated in the parasites by the fusion of G6PD with the second enzyme of the PPP, allowing for direct substrate transfer within the pathway. G6PDs from most organisms exist as monomers (Bos taurus ), dimers (e.g. Trypanosoma brucei ), or tetramers (Sus scrofa ); hG6PD exists in all three forms depending on the ionic strength, pH, and presence of substrates  and under native and reducing conditions, PfGluPho is active as a tetramer . In this study, recombinant PvG6PD was present as a hexamer under reducing conditions. Such a hexameric oligomerization was not previously described for G6PDs (Brenda, EC 1.1.1.49) and might actually represent an artificial state since PvG6PD occurs as a fusion protein with 6PGL under physiological conditions. The oligomerization state of full-length PvGluPho is presumably different—based on the high sequence identity with PfGluPho likely tetrameric. In recent years, the importance of enzyme regulation via post-translational modification (PTM) of reactive cysteine residues has been increasingly recognized [62, 63]. Therefore, two of the most important PTMs, protein S-glutathionylation and S-nitrosation, were studied on G6PD of P. falciparum and P. vivax. S-glutathionylation has been shown to play a role in protein folding and stability as well as the redox regulation of multiple metabolic pathways. During episodes of oxidative stress, S-glutathionylated proteins can serve as a storage form of GSH, while the modification prevents the protein from irreversible oxidation . As indicated in Fig. 2, neither PfGluPho nor PfG6PD and PvG6PD are prone to S-glutathionylation at concentrations up to 6 mM GSSG. At 10 mM GSSG the proteins precipitated irreversibly. Therefore, the previous hypothesis that the activity of PfGluPho decreases after incubation with higher GSSG concentrations  is likely to represent an artefact rather than a specific regulation. This is also in accordance with previous proteomic analyses, where PfG6PD was not identified as a target of S-glutathionylation . As recently reported, 6-phosphogluconate dehydrogenase is not susceptible to S-glutathionylation either , suggesting that this redox PTM does not play a major role in the regulation of the oxidative PPP in Plasmodium. Protein S-nitrosation mediates many (patho)physiological effects of nitric oxide (NO). It can influence protein conformation, stability, and activity; alter protein–protein interactions; and influence cellular signal transduction processes [62, 65]. In a previous proteomic approach, PfGluPho was identified as a target of S-nitrosation , which could be confirmed—for PfGluPho, PfG6PD, and PvG6PD—in this study. Since the C-terminal part of PfGluPho, PfG6PD, showed the same results as full-length PfGluPho in both western blot and kinetic analyses, S-nitrosation sites are likely located in the G6PD part of the enzyme. S-nitrosation of all three enzymes leads only to minor changes in enzyme activity (Fig. 3). During recent years, extensive research has been performed to elucidate the genome-wide diversity of Plasmodium species . These variants might supply the parasites with evolutionary benefits to deal with the selection pressure . Interestingly, there are also naturally occurring mutations within the PfGluPho gene. Since this enzyme has a central role in the maintenance of cellular redox balance, it is hypothesized that these mutations might lead to altered enzymatic activity and modulation of antioxidant defense. Therefore, the mutants PfGluPhoL395F and PfGluPhoF507L, which are located in the G6PD domain of the PfGluPho gene, as well as PfGluPhoS315Y located in the linker domain between 6PGL and G6PD, were created, produced, and tested. F507 is located in an insertion sequence of the gene that is specific for G6PDs of Plasmodium and differs in size and sequence between the species. In the Plasmodium berghei enzyme, this insertion has even been shown to be essential for G6PD activity . However, neither enzymatic activity nor substrate affinities of the tested mutants differed significantly from the wt enzyme (Table 2). Moreover, the potential impact of the naturally occurring phosphorylation was assessed (for a review see ) of the Plasmodium-specific serine residues 899 and 900 on the kinetic parameters of PfGluPho (Additional file 1). However, the respective phosphorylation-mimicking mutants did not show significant differences to the wt. Therefore, it can be concluded that the activity of PfGluPho is not strongly regulated in vivo by the three naturally occurring mutations or the phosphorylation of serines 899 and 900, unless these variations influence other properties of the enzyme such as protein–protein interaction or stability. Within this study, various potential inhibitors were tested on PvG6PD, namely ellagic acid, its derivatives flavellagic acid and coruleoellagic acid, the PfGluPho inhibitor ML304, and a new series of compounds synthesized as potential Plasmodium G6PD inhibitors. Ellagic acid was identified to be an active component in plants that were used in traditional West African medicine for the treatment of malaria . Interestingly, it inhibits the growth of P. falciparum strains in vitro (IC50s from 105 nM to 1.3 nM depending on the strain) and those that are resistant to chloroquine and mefloquine [32, 33]. Additionally, it is active against Plasmodium vinckei petteri in an in vivo mouse model (IC50 1 mg kg−1 per day i.p.) in suppressive, curative, and prophylactic tests while being well tolerated . Ellagic acid is supposed to act against mature trophozoites and young schizonts and shows synergistic effects with chloroquine, atovaquone, mefloquine, and artesunate . The mechanism of action of EA has been discussed extensively in several studies. Different enzymes such as glutathione reductase, glutathione S-transferase, and thioredoxin reductase are known to be targeted by the compound and its derivatives FEA and CEA, (IC50 between 22 and 78 µM [33, 34]). Furthermore, EA is supposed to decrease the glutathione pool; this observation is strengthened by the finding that a Plasmodium yoelii strain overproducing GSH is five times less sensitive towards EA than the wt . In summary, the observations so far have indicated a rather broad mechanism of action by affecting the antioxidant balance of the parasite. The authors recently showed that EA inhibits PfGluPho with an IC50 of 77 ± 22 nM, which is three orders of magnitude lower than the IC50 values determined for other redox-related enzymes . As shown in this study, EA also strongly inhibits PvG6PD (IC50 = 32.5 ± 13.4 nM), and the mixed type inhibition with respect to both G6P and NADP+ as observed for PfGluPho could be confirmed for PvG6PD (Fig. 4). The IC50 values of the EA derivatives FEA and CEA on PvG6PD were also in the lower nanomolar range. Although the effect of EA is not selective for plasmodial enzymes (IC50 for hG6PD: 102 ± 39 nM) , the overall toxicity in mice is low, and there are no observable haemolytic effects , pointing to a higher susceptibility of the rapidly growing and multiplying parasite. The compound ML304 was identified during a high-throughput screening of various compound libraries including LOPAC, Spectrum, DIVERSet, and the MLSMR collection of the NIH . Two compounds of the MLSMR collection were identified to be potent inhibitors of the G6PD activity of PfGluPho, namely ML276 and ML304. Synthesis and detailed enzymatic and pharmacokinetic characterization of ML276 is described in . With an IC50 of 0.89 µM against PfGluPho and of over 80 µM against hG6PD, ML276 is selective for the plasmodial enzyme . ML304, so far only described in an NIH probe report, has an IC50 of 190 nM against PfGluPho (> 80 µM against hG6PD) and is even more effective than ML276 . In cell culture, ML304 is active on the chloroquine-sensitive strain P. falciparum 3D7 at concentrations lower than 1 µM and on the CQ resistant strain Dd2 at a concentration of about 5 µM. With an LD50 > 50 µM, major cytotoxicity against human hepatocyte cell lines could be ruled out . Within this study, ML304 was also confirmed to be an inhibitor of PvG6PD with an IC50 of 2.6 ± 0.8 µM (at substrate concentrations close to KM values) and a Ki value of 0.7 ± 0.3 µM. Mechanistic studies indicated a competition with the substrate G6P (Fig. 5a). In cell biological experiments, it could furthermore be shown that ML304 significantly disturbs the cytosolic glutathione-dependent redox potential of P. falciparum blood stage parasites. This was shown for 3D7 parasites episomally transfected with the hGrx1–roGFP2 redox sensor (Fig. 6) as well as for stably transfected NF54[hGrx1–roGFP2]-attB parasites (Fig. 7). The disturbance was time and dose dependent and already occurred at very low micromolar ML304 concentrations. Recently, it was shown that the dynamics of hydrogen peroxide are also affected by ML304. Employing stable integration of the H2O2 redox probe roGFP2-Orp1 into blood stages of NF54-attB, ML304 was found to significantly increase the cytosolic H2O2 levels . It can, therefore, be deduced that inhibition of the G6PD reaction, likely followed by impairment of NADPH fluxes, markedly affects antioxidant capacity in Plasmodium parasites. This is further supported by the finding that ML304 and the redox cycler methylene blue have synergistic effects on late stage gametocytes . The redox-cycling activity of methylene blue leads to consumption of NADPH, while the simultaneous inhibition of PfGluPho by ML304 prevents the generation of new NADPH. Currently, this concept is being followed up. Based on a chemical compound screening and following SAR studies, a set of new potential G6PD inhibitors was synthesized and assessed (Fig. 8). In fact, this approach resulted in two new compounds with nanomolar activity against PfGluPho and/or PvG6PD, which will be followed up in detail. In the past, it was demonstrated that nitro-activated perchloroalkenes are unique building blocks for the synthesis of many microbiologically active, highly substituted heterocycles. Most of the tested compounds have been synthesized this way. One of the big advantages to this approach is the feasibility of modifying and tailoring the resulting heterocycles [69–71]. The glucose 6-phosphate dehydrogenase 6-phosphogluconolactonases of P. falciparum and P. vivax share many features. Both are bifunctional enzymes catalyzing the first two steps of the oxidative PPP, thereby producing 6-phosphogluconate and NADPH. They share high amino acid identity, conserved substrate binding sites, and kinetic properties. All compounds tested in this study inhibit PfGluPho and PvG6PD with comparable efficacy and modes of action. With ellagic acid, ML304, and compound 4 (vz1732), promising inhibitors with micro- to nanomolar activity are now on hand. It has furthermore been demonstrated that ML304 markedly disturbs the glutathione redox balance of Plasmodium parasites, thus further proving its mechanism of action. We therefore propose to following up the development of G6PD inhibitors as novel anti-malarial agents, bearing in mind that it might be possible to develop one compound that is equally active against both P. falciparum and P. vivax. KH contributed to enzyme production, kinetics, inhibitor testing, and characterization of PTMs and wrote the manuscript; IB, EJ, and JP contributed to mutagenesis, enzyme production, and kinetics; JH and NS contributed to the characterization of PTMs; MR conducted the experiments with the genetically encoded redox probes and contributed to writing the manuscript; VZ and DK synthesized the new G6PD inhibitors; LB and AP contributed materials, inhibitors, and discussions; SR supervised the molecular biology work, KB designed and evaluated experiments, provided materials, and wrote the manuscript. All authors read and approved the final manuscript. The authors wish to thank Siegrid Franke and Michaela Stumpf, for their excellent technical assistance, and Christina Brandstaedter for help with figure preparation. We thank Florenz Sasse for offering the compound library; furthermore, we would like to thank Angeles Stegmayer and Max Reichmann for their support with the kinetic measurements. This work was supported by the LOEWE Center DRUID (Projects B3 and E3) within the Hessian Excellence Program, by the German Research Foundation (Grant BE1540/23-2 within the DFG Priority Program 1710), and the NIH (RO1 AI104916-01 A1). 12936_2019_2651_MOESM1_ESM.docx Additional file 1. Multi-amino acid sequence alignment of G6PDs from different species. The C-terminally located Ser–Ser pair (S899 and S900) found to be phosphorylated in P. falciparum is specific for malaria parasites. Pf, Plasmodium falciparum (PlasmoDB PF3D7_1453800); Pv, Plasmodium vivax, (PlasmoDB PVX_117790); h, human (NCBI CAA39089.1); At, Arabidopsis thaliana (NCBI BAE99888); Sc, Saccharomyces cerevisiae (NCBI CAA93357). | Identical residues, : very similar residues, . similar residues. 12936_2019_2651_MOESM2_ESM.docx Additional file 2. Oligonucleotide primers used for site-directed mutagenesis of P. falciparum GluPho. 12936_2019_2651_MOESM3_ESM.docx Additional file 3. Synthesis of G6PD inhibitors. 12936_2019_2651_MOESM4_ESM.docx Additional file 4. Substrate concentrations for the kinetic characterization of PfGluPho, PvG6PD, and hG6PD. 12936_2019_2651_MOESM5_ESM.pdf Additional file 5. Amino acid sequence alignment of PfGluPho (PF3D7_1453800) and PvGluPho (PVX_117790). | Identical residues, : very similar residues, . similar residues. WHO. World Malaria Report 2017. http://www.who.int/malaria/publications/world-malaria-report-2017/report/en/. Accessed 20 June 2018.